Arthur Poppington (Harrelson), a mentally retarded crossing guard, moonlights as an eye-blacked avenger with a budget arsenal including marbles, wasps, and a trench club. Saving a teenage prostitute (Dennings) from a corrupt undercover cop (Koteas), Arthur comes to see her pimp as his archenemy, Captain Industry. Defendor‘s premise sounds comedic, but its physical and gun violence and drug use are unflinchingly real. I recommend it to adults who grew up wanting to be heroes. 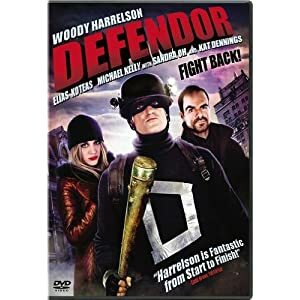 The DVD includes deleted scenes, outtakes, five behind-the-scenes featurettes, and a commentary with Woody Harrelson, Kat Dennings, writer-director Peter Stebbings, and producer Nicholas Tabarrok.